Please see the new kapustnica recipe. The new pictures are much nicer! 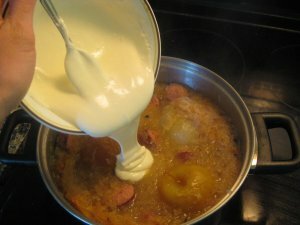 Kapustnica is by far my favorite Slovak dish. 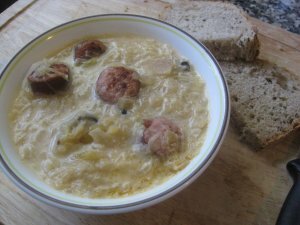 It is a soup made with sauerkraut, mushrooms, pork, sausages, and various spices. It’s really delicious and rightfully very popular. It’s traditionally eaten on Christmas, but you will find this soup offered in all Slovak restaurants year around. On Christmas, this soup is typically followed by fried fish with potato salad, and then by a variety of Christmas “cookies”. And finally, right after dinner is when we run to the Christmas tree to open presents. Start by adding sauerkrat to a large pot. Add about a liter of water. I used a liter jar of sauerkraut from Whole Foods in making this recipe. 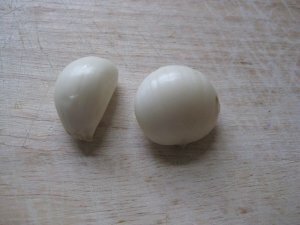 Next take two cloves of garlic and do your best to turn them into a paste. I used a food processor to chop up the garlic, and then crushed the chunks in a bowl using a spoon. Add the garlic. two bay leaves and dried mushrooms. Then add an onion and two small apples. Also add pork cut into small pieces. Add more water if needed and let cook for about 20 minutes. While the beef is cooking, take some spicy smoked sausage and cut it into pieces. Sometimes you can find smoked Hungarian sausage that is very similar to what is used in Slovakia. But, if not, then just use your favorite store-stocked brand. Depending on the sausage you use, you may want to brown it a bit to improve the taste. Add after the soup has cooked for about 20 minutes. Also add some crushed red pepper and paprika. Cover and let simmer for 30 minutes. If you like your soup light, you are done. However, this soup is typically thickened with sour cream. 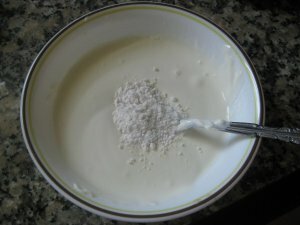 Mix the thick sour cream available in US stores with about an equal amount of milk. Add a spoon of flour and mix well. Next add the mixture to the soup, and cook for about a minute. Stir as needed. Enjoy with a slice of rye bread. For another great soup, checkout the recipe for goulash. 64 comments - What do you think? really? are you supposed to add sour cream at the end? I did not know that! My Ukrainian grandmother made hers differently from this recipe but, to answer your question, at the end what she added was NOT sour cream but rather what she called zaprashka which was onions cooked in butter for a long time over a very low flame; never browned. She poured it over the top. Same in our family. The Christmas kapustnica was made without the meat. as for the meat we don’t add the smoked sausage on Christmas eve, however next day when we are re-heating the soup we cut some sausage and add it to the soup before re-heatingto make it taste better. 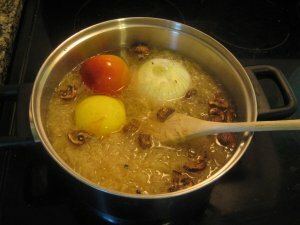 Cover mixture(the sauerkraut and mushrooms) with water. Make a mixture: 1 cup milk, 2 tablespoons flour, mix ….and hand beat mixture be sure there are no lumps . Add to sauerkraut mixture and let the whole thing simmer for approximately 1 hr….Add prunes to the above, the last half hour. An awesome soup that doesn’t require any spice, meat or herbs. You can add to taste later in your bowl….I love the simplicity of just: sauerkraut, mushrooms, whipping cream, flour, and prunes. Hope you enjoy!! Thanks for sharing! Meat is not always necessary. Hello I have a recipe for whole dried peas and sourkraut soup we serve at christmas eve dinner. Soak peas over night .To prepare you are going to make a spraska or rue. Melt your butter in a medium pan, Then gradually add the flour until the flour mixture is medium brown. Set aside the sapraska for now, Bring you water to a boil. Then Add your Peas and cook for one hour. You will have to add more Water due to boiling reduction. Add the kraut. The the sapraska. Salt and pepper to your taste. The sapraska Will make this a very thick soup. Some people make it very thick and serve it over mashed potatoes. Enjoy! My grandma made yukah at christmas also. Instead of millet, she used barley. she used smoked ribs and smoked keilbasa. When i was a kid, i thought i was having a heart attack. mom asked if i ate the yukah, i said yes, she said it was heart burn. 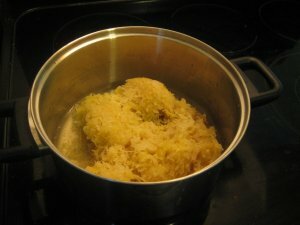 My grandma used to make a sauerkraut soup at Christmas, it was called Yukah, and there wasn’t any apples in it. Here’s the recipe that she used. Rinse then soak mushrooms in boiling water for 1 hour, retain mushroom liquid, discard stems and cut up into pieces. Put all meat into pot, just cover with ½ water & ½ chicken broth and simmer for 45min to 1 hour. 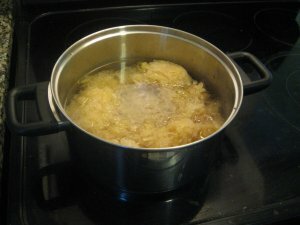 Add sauerkraut, mushroom liquid, and add back in water or chicken broth to make up what was lost during cooking. Cook until millet seed thickens the soup and the millet seed is tender about 30 min. If too thick add water or broth. Use the sauerkraut juice to taste if you like a more sour soup. Thanks for the note. Where was you grandma from? I don’t know any dish by the name Yukah, but then there is a lot of variety in Slovak cooking, especially for such a small country. 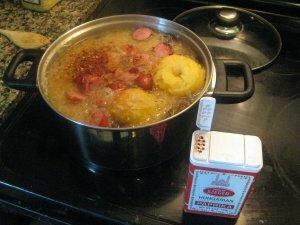 My mother makes a similar recipe, only she makes it with just pork and kielbasa (sometimes hot dogs too) and potatoes. She got it form her mother, who came from Slovakia. It is called Yukah soup, not sure if thats spelled right(seeing it different thinking back at grandmas recipe book), but its pronounced U-ah soup. 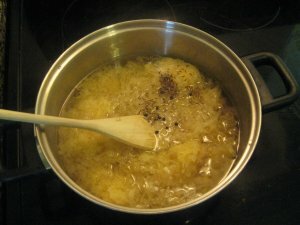 its a variation of the sauerkraut soup, and im surprised to find anyone else who knows about it. I have searched forever now and I could not find any other recipes, or the proper spelling for it. Alright, I think I’ve found the answer to this mysterious Yukah. I contacted some friends and relatives, and it turns out that jucha (pronounced yoocha, where the ch is as in Loch), is the word for sauerkraut juice. I don’t think this word is used outside of eastern Slovakia, at least I have never heard it. The eastern part of Slovakia has a pretty distinct dialect. Many words are different from what’s spoken in the eastern and central parts and many people from the rest of the country (including me) have a hard time understanding folks from the west. We found an article (in Slovak) talking about Christmas traditions in eastern Slovakia. The first few paragraphs describe this yukah soup and also it’s variant, mačanka. The article starts by stating that Christmas dinner in eastern Slovakia contains dishes unknown to the rest of the country. One of these is the jucha soup, made of sauerkraut juice, black pepper, dried peas, plums or dried mushrooms. Sometimes it’s topped with melted butter. The mačanka soup is similar, but contains dried mushrooms, garlic and onion. It’s thickened with flour or sour cream. Mačanka is eaten by soaking pieces of bread in it. This is where the name comes from – máčať, from which the name is derived, means to soak. Anyway, thanks for bringing this up. I started the website so that Americans can learn more about Slovak cuisine. Turns out, I have plenty to learn as well!! Interestingly, “juha”, which would be pronounced with a hard “h” just like the Slovak “ch” is the general word for soup in Croatian, a related Slavic language. I got a similar recipe to the one with barley. all it listed was ingredients!! Grandmas cooking at it’s finest! Glad you have all shed some light. She called it Yuha. Listed the following, Keibasa, Pork, Fresh Pork, 1 c barley, mushrooms, sauerkraut, tomato juice. Thats the recipe!! OK, Kapustnica is something like “religion” to me. I make it a few times a year but there is no Christmas without Kapustnica. A few differences in recipe. 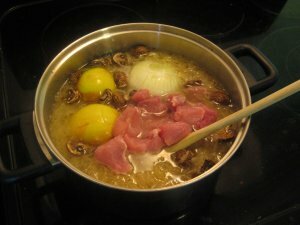 I start with boiling a meat, and I use at least 3 kind of pork meat. Some pork shoulder, some smoked meat (smoked hocks “nozicky” or knees “kolienka”), and some smoked ham. After about 45 min. I take meat out, and put in sauerkraut, seasonings, dried mushrooms, a few dried plumbs, onion, garlic, etc.. I cut the meat into small pieces, get rid of “skin” and use only meat. I like a “clear soup” and add cut meat back in at the end. 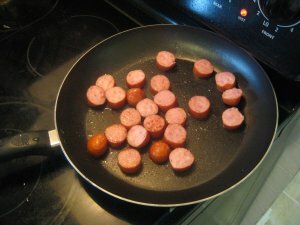 I add “smoked sausage”, sliced into small pieces to each serving when on table, and I put out a bowl of sour cream on table so that everybody puts as much as they like onto their serving. There is a variation (my mom used to do it) to use some barley to make is more “substantial” I like it more clear and that’s a way I do it. Hi folks, I updated this recipe. 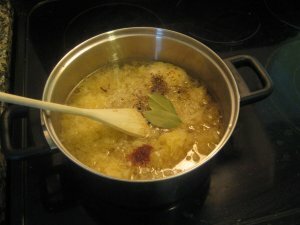 Please see the new sauerkraut soup (kapustnica) recipe for better photos and to leave a comment. Does anyone know how to make Buchta, the slovak old fashioned veal loaf for sandwiches? Thanks. Somebody on the Facebook page suggested something called “Sekanice”. Here is the recipe. Is this what you were looking for? Tento recept je riadne hlupy. Do kapustnice sa dava najprv maso a klobasa, ktore sa musi dlho varit. Potom sa da kapusta, huby a ochuti sa. Cesnak, nutmeg, hromada cibule a jablka tam urcite nepatria. Hi DK, this recipe is from “Grandmother’s Recipes” (Recepty Starej Mamy). You should try it. I’ve had my share of kapustnica and this one is by far the most delicious. Hi lubos, thank you for sharing your Grandmother’s recipe. 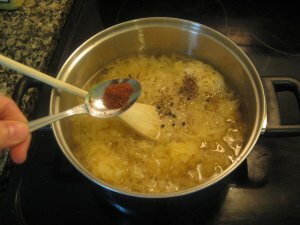 Are the apples and onion just used as seasoning for their added flavor, or do they somehow end up in a serving of soup (sliced/crushed)? Hi David, the onions will more or less dissolve into the soup, but the apples will stay fairly whole. The apples are used to sweeten the soup. Some people use sugar, I suppose this is the more traditional and more natural method. The apples get scooped out before serving. I am of Polish and Slovak ancestry. My Aunt ( on my Dad’s side ) just made a quick soup. 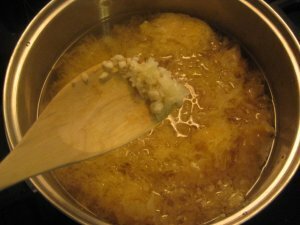 She would saute onions in a dutch oven or soup pot until golden brown. In the meantime she would boil about 6-8 potatoes, peeled. When the onions were ready she would sprinkle flour in to make a roux. She would add sauerkraut juice only to the onions. The potatoes she would cube, then put in the pot with the juice. She used to buy a packet of wide noodles that were cut into squares. She would cook the noodles, then put a serving into the bowl and top with the soup. Adding kielbasa or other meats would probably be good but I like it the way it is. Fun to read all the comments. I am from eastern part, with my parents from west and central Slovakia. I can say that every family I know has a different recipe for Kapustnica. Ours consists of sauerkrat, water, saugsages, paprika, dried mushroom (dubaky), paprika, and some lard. (Maybe some spices, can’t remeber now) Cook all toghether. Basic recipe. My wife’s family would add dried prunes. They also fry the sauage before cooknig it – not my style. We used to make one with meat and sour cream and call it “zabijackova” – since it was made usually when pigs were slaughtered – similar to segedinky gulas. Yum. Kapustnica has got to be one of my favorits. Enjoy reading all the comments – my mother was full blooded slovak and always made christmas soup. I am now searching for recipes to continue the tradition with my children. Thanks for all the info. My Slovak wife makes this, too, but she peels, cores, and slices some small apples rather than using whole apples. Also, she does not use a whole onion. Otherwise, I used your recipe and it was good. I will make it again next Christmas. We never had meat in the soup, Christmas Eve was a “fasting night”. We had 12 dishes, each meant something. 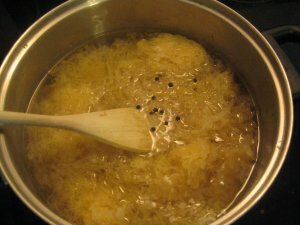 We dried mushrooms all year, and made the soup from them with kraut and its juice, brown onions, water and thickened. Hi Maxine, you are right, Christmas Eve is a fasting day. This version with meat in it would be more popular for New Years Eve dinner. The only meat that could be eaten on Christmas Eve was fish, and that’s why fried fish has become Slovak Christmas dinner meal. Hello again! We met in WI, you were judging kolaches, and I was judging queen candidates. 🙂 I have been following your web-site for some time now and love all the recipes. My mother and I have been asked to cook-up some sauerkraut recipes again at a Babi’s Kitchen event in Iowa. I’d like to try a couple new recipes we haven’t done before. Do you mind if I borrow a sauerkraut soup and/or Pirohy recipe? I’ve found several in cookbooks/internet, however if you don’t mind, I’d like to cook yours within the next couple of weeks, have my family taste test and then be able to state that these are your recipes. Let me know. Thanks! Ja som zvyknutá na kapustnicu na tento spôsob. Zemiaky ale varím zvlášť v kastróliku, lebo sa v kapuste neuvaria. V kapuste varím údené kosti, nedám bujón a zahusťujem ju zápražkou. Moja mama varí kapustu so šošovicou. Nikdy ju však nezahusťujeme smotanou ako Ľuboš, to by bol potom segedínsky guláš. We use sourcream (smotanu) not so much to thiken the soup but to cut a “sour” taste and acidity of soup that some people, including my kids, does not like. We don’t add a sourcream while soup is boiling, just put a sourcream on a table and let everybody decide if and how much to use. Yes, Fasting on Christmas Eve was our tradition too. 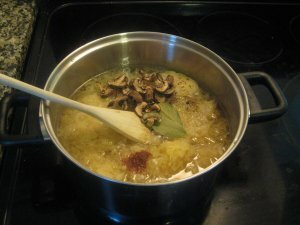 Our soup consisted of ground dried brown mushrooms, onions, butter, sauerkraut and thickened with a flour paste at the end. This is the tradition in my household too. We just enjoyed the soup last evening. Also made Babalky – no poppyseed in mine but lots of butter! We enjoyed the waffer and honey to. kraut (I think), potatoes and onions. She would add sour cream at the end. I don’t remember what else went in it. It was sour and she just called it Ukrainian cabbage soup. There were no tomatoes or carrots in it. It looked like curdled cream and it was quite anemic but it was very good. For the first meal (there were always tons), my father would eat the spare ribs with the sauerkraut and we would eat the soup. You will NEVER get the exact recipe your mom or grandma did, unless you get it from them. 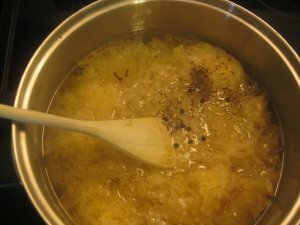 Sauerkraut soup can be made with a lot of different ways, using different ingredients. etc. And all of them are good. Hello Miro, thanks for your feedback. Had I been able to ask my family, I certainly would have. I’ll just try my own. sorry to hear about the family, most of mine is gone as well. As I said, there is a plenty of variation how to make this soup in this thread. Try to find one you think is a close to what you were used to, based on ingredients, try it and then adjust it a bit to your own taste. THANK’S SO MUCH-MIRO I’lldo that,does paperika belong to this rescipe? I have heard slovak 5 spice but do you know what goes into itJean? We are having no luck with my wife’s grandma’s recipe for kielbasa soup. 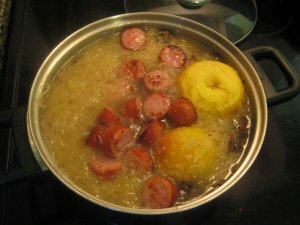 It was made with sauerkraut juice, dried mushrooms, barley, potatoes and kielbasa. Anyone out there have a recipe like that? Sure would appreciate it. Had a bumper crop of cabbage last summer, thus a bumper crop of sauerkraut. I was delighted to find these recipes, as it’s a way to use up the kraut. (I made both white and red, and there’s only so many times you can have sweet-sour red cabbage w-bacon. )I drain the juice first and save to drink later-being homemade it’s not so awfully sour as store-bought kraut. About the same tartness as lemonade. This soup is my youngest daughter’s fave. I am a third generation Slovak and I make a similar soup every Christmas but it is a bit more complicated. Start out by boiling smoked ham hocks, when the meat falls off the bone, take the choice meat and put in a food processor but you are mainly after the broth. Place the broth in a cool place overnight so that the fat rises to the top, remove fat . On Day 2 now place your sauerkraut and 1 pound of fresh cut mushrooms into the broth. Fry your sausage in 1 inch pieces and add…. don’t forget to add that ham that you put in the food processer. Add 5 prunes which are key for flavor and add spices (only black pepper) is needed. Simmer on slow heat all day…….. you do not have to add the cream. This takes a minimum of 2 days…….. but it is worth it. Have that at your Christmas dinner…….. it will all go very quickly. My In-Laws were from Prague and our Christmas soup was diced potatoes diced and boiled until almost done, the add mushroom and cook until they are done then add sauerkraut and thicken a little with a roue made from butter and flour. I saw in a comment that you had judged kolaches. I grew up eating them and desperately want to find some authentic recipes. My father was Czech. Do you have any to share? Second, last night I just created a fabulous sausage and cabbage stew, really because I didn’t have time to cook my corned beef and cabbage for my 90-year old friend. I improvised with what I had, kielbasa sausage, cabbage, potatoes, carrots, onion, garlic, chicken broth and fresh parsley, basil and rosemary, and pepper. No sauerkraut, no tomatoes, nor vinegar or sour cream. It was outstanding and I’d like to know if there’s a Czech or Slovak name for a similar stew. Thank you. Love your site and info! you may go Google and type “Kapustova Polievka z cerstvej kapusty”. There are many recipes, variations but essentially same as what you cooked. My mother and grand mother made the soup using parsnitnia ( caramelized onions,flour,garlic, ) sour kraut juice, boiled to taste (sourness) after soup is done drop in eggs (pouched)and serve in bowl over potatoes,green split peas. mmmmmmmmmmmmm Delicious. The kapustnica, both Christmas fasting type and regular kobasy/smoked pork hock or neck type are from what one of the other bloggers called “Eastern Slovakia, where the dialect is different, as are some of the dishes that do not appear in the rest of Slovakia”. For your Edification, the people that inhabit that region of northeast Slovakia, Southeast Poland, the Transcarpatian Ukraine, northwestern Romania, and parts of Croatian Slavonia and Serbian Banat are the ethnic Carpatho-Rusyn people. In those countries mentioned, they are known as Rusyns, Ruthenians, Lemkos, Boykos, Hutsuls, Carpatho-Russians, Carpatho-Ukrainians, Dolynanie, Verkhovyntsy, Uhro-Rusyns, and Slavish. Their Carpatho-Rusyn language was codified in 1995 as a Separate East Slavic language. What do you do with the onion and apples after cooking? When searching for a good kapustnica recipe last year, I found so many different variations. My questions is about “dried” mushrooms. I see that maybe 95% of the posts here mention dried mushrooms. For me the mushrooms have to be dried. My grandmother had dried mushrooms mailed from her sisters in Slovakia. My question is — what kind of dried mushrooms should be used in kapustnica? Or does it not matter? Also, not sure this was posted by anyone, but Stredy Vecer was always a day of fasting for Slovaks years ago, which is why meat was not used in kapustnica. I’ve talked to Slovaks that still will not include meat in this meal — and others who do. It would be interesting to hear from any Slovaks reading this about whether or not they use meat on Stedry Vecer. Help!!! I just made my mushroom/sauerkraut soup and it is too sour. I don’t have any more mushroom juice to add to it. What can I do??? My sister-in-law makes it swoop at Christmas called “penzeroki” not at all sure of spelling. 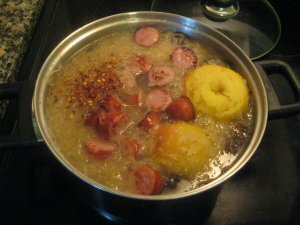 It is made with sauerkraut, dried mushrooms, ribs, barley, cottage ham, kielbasa. I would love the actual recipe. BEEF? Beef isn’t listed in this recipe nor is beef a traditional ingredient. 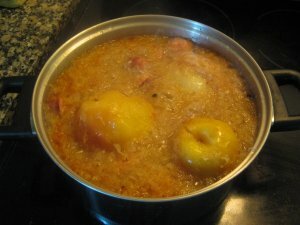 What are you doing with the Whole Apples and Onion you added according to the Pictures? Discarding them after soup is cooked? Cutting them up, then adding them back to soup? Just a few of the many many question this recipe creates. I respect the effort, but please proof read and edit your information before posting it online.